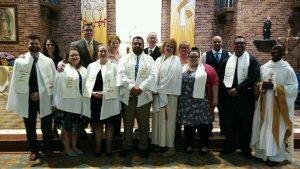 RCIA/C, or the Rite of Christian Initiation for Adults and Children is a formation program for those who are interested in converting to Catholicism, for those who are lapsed Catholics, or those who would like to complete the sacraments of initiation (Baptism, Holy Eucharist and Confirmation). RCIA/C is a journey of faith that will lead one to God and to the Church. This is done in four stages: pre-catechumenate, catechumenate, purification and enlightenment, and initiation. Some of the topics discussed during the process are: how to listen to the Word of God, the Bible, prayers and rituals, Church history, the Ten Commandments and their impact on our lives today, and the ministry of Jesus. Sometimes when God calls out to us, we feel we are not ready or worthy of getting to know him and his endless love for us. God calls for a reason. He knows when we are ready. The first steps of any journey are always the hardest. We are here as a parish community to walk with you and be there for you. Mary Vozniak is our RCIA/C coordinator. She is currently attending Sacred Heart Major Seminary in Detroit, working on her Master’s Degree in Pastoral Ministry and Education. She is an active member of the parish and is involved in liturgical ministry. She will be happy to talk to you about the program. She can be reached by telephone or at (313) 574-9357 or by email at SABreled@outlook.com.